Home » Calls to action » Where Have all the Plastics Gone?? Where Have all the Plastics Gone?? In the book, Saving the Places we Love, I described the major oceanic gyres and how they tend to concentrate the plastics that we discard. Many of the original pieces of plastic that have gotten into our oceans have broken down and now exist in many sizes down to micro-plastics. They are easily consumed by a wide range of marine life and eventually by us. These large, floating plastic enclaves, some as large as the state of Texas, can be harmful to marine life because along with the chemicals associated with the plastics, a range of chemicals, algae, and bacteria are also associated with them. As our knowledge and concern about these plastics expands, there is also a growing group of scientists who are trying to understand the provenance, toxicity, and impact to life of micro-plastics in the oceans. Of course this is not just a problem way out in the oceanic gyres. The plastic has to get there and since much of it came from us, we are obviously polluting not only our oceans but also all of our waterways and water bodies. Plastic debris in these waters comes from agriculture, trash, flushing medicines down our toilets, plastic bags and bottles blowing out of our recycle bins and off our back porches, and weekly washing of plastics in our clothing. We have chosen to make plastics ubiquitous in our lives and as a result it is also ever-present throughout our environment. Locally, Trash Free Maryland, is trying to get a better handle on this question of how much plastic is in our local environment. Julie Lawson, their Executive Director has organized a program for gathering data for all of us to consider when evaluating the need for state-wide action. 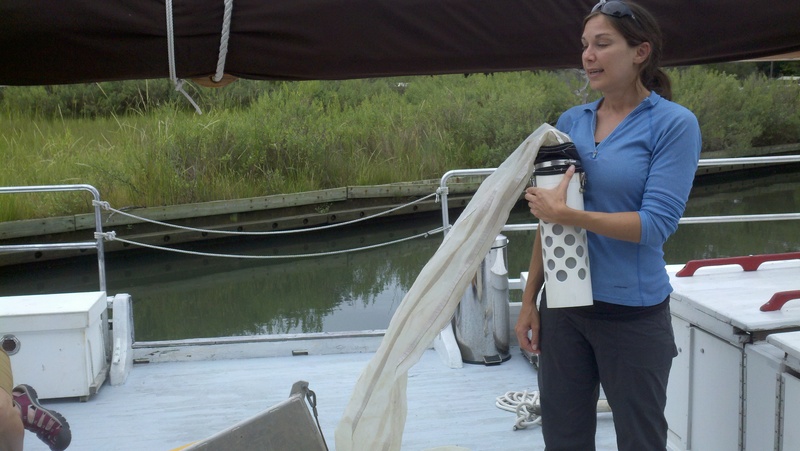 One of the efforts they are conducting now is the sampling of waters in the Chesapeake Bay. Kathy and I were invited to Solomons Island to be part of a multiple day trash trawl to collect samples throughout the Chesapeake. 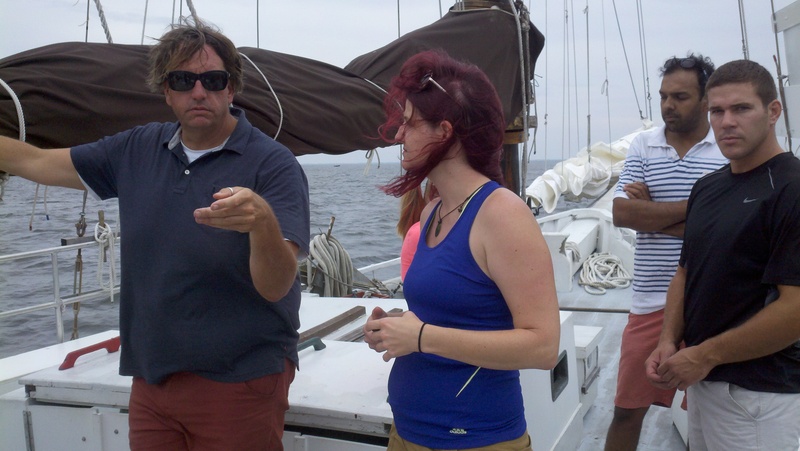 We went out with Julie on a skipjack “The Dee” based at the Calvert Maritime Museum. Chelsea Rochman, a Professor at the University of Toronto and a leading authority on oceanic waste, directed the sample collection and will do some of the analyses along with the EPA. Stiv Wilson, who co-founded the 5 Gyre Institute and is now the Campaign Director at Story of Stuff, joined us as well and helped rig and launch the manta trawl device that collected the samples. He has worked with Chelsea in the past collecting samples on voyages across the Pacific. Julie is planning 15 days of sample collection this month so we should have a good look at what is in our Bay at the end of this project. The answers won’t be immediate but just from a visual inspection of the waters, it is clear there are many small plastic pieces in the samples we collected. The real question we need to address is how harmful is this contamination and is it possible to reduce the amount of waste we are generating and dumping into our valuable natural resources. We can all do more by not using plastic bags and containers, reusing the ones that we do buy, and as a last resort, being sure they are disposed of properly. The question before our politicians is are there ways to help educate, incentivize, and possibly regulate our use of plastics to decrease the amount that ends up being consumed by the bottom of the food chain and eventually by us. Stay tuned!!! Take-a-way: We need to reduce our use and abuse of plastics. By nedtillman2 in Calls to action, Oceans on September 2, 2015 .